The deep black of the watch face contrasts with the gold of the hands and indices, giving this Spring Drive chronograph an alluringly mature gloss. The case and band are made with Brightman titanium, providing a scratch and corrosion resistant finish with a 137g weight reduction, making it 30% lighter than stainless steel and a pleasure to wear. At its core, the watch is powered by a Grand Seiko’s unique Spring Drive caliber, which combines the motive force of a mainspring with the high precision of a quartz watch, and offers the high-accuracy functionality of a chronograph. 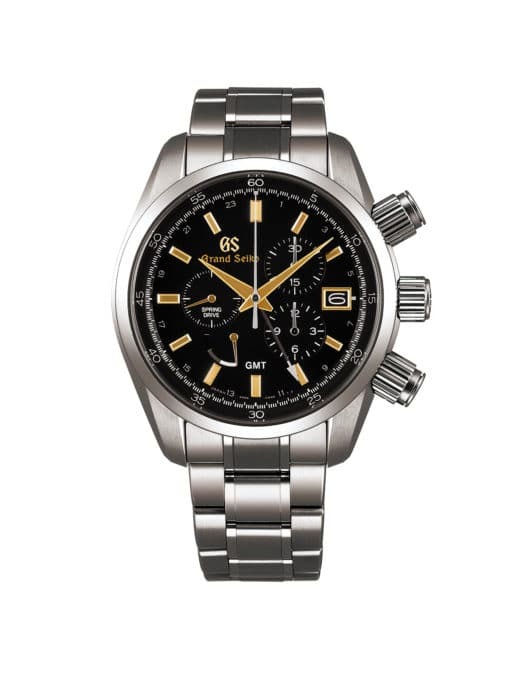 Grand Seiko’s original glide motion is also featured in the chronograph’s second hand. The chronograph utilizes a Ready/Start button with a half-press shutter, reducing mistakes and allowing for accurate starts. The button has been designed with comfort of use in mind and produces a satisfying click with just the right resistance.